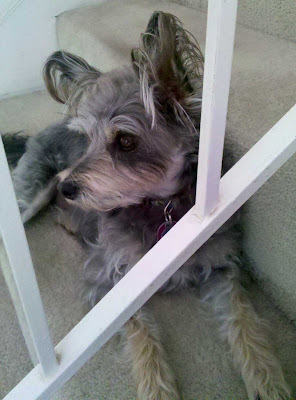 One of Cirelle's recent photos of her beloved dog, Jemmy. The very one rescued for her from the mean streets by noneotherthan Shel Rasch! He's a happy, loved, and healthy doggy now. Dig those crazy fun ear wisps! It's been a full year since the day Shel picked Jemmy off our street after our visit. She cleaned him up and gave him to Halfland volunteer Cirelle. In that year, Cirelle has learned to take superb care of a such a bright, adorable dog and he is enjoying the sweetest pampered puppy life to be sure. He has the best friend a dog ever could in Cirelle, and she the best companion woman's ever had. They have each other thank goodness. She told me that the other day on one of his many fun walks in the park, he inadvertently stepped right on a bee in the grass with one of his hind legs and it stung him on a back paw paw. He yelped and hopped as fast as he could go on three legs, leading Cirelle home by the leash the whole way. They got in and he ran right up stairs and dove straight under her bed as his place for comfort and safety. She of course collected him immediately and took him to the vet to make sure he'd be alright from the sting. She was worried (he turned out to be fine) but to her the episode let her know for certain that he knows where to go if anything goes wrong with life... he goes Home. He has, at last, a real home. With this new fellow in her life, and her puppet project fully done, I don't suspect Cirelle will have time to work in Halfland much going forward. But I wanted to thank her for all that she has done for it and for her being Halfland's Muse in inspiring other people to come and work for a time. Good things tend to happen for people when they are around Cirelle. That's really cool and sweet.